This week we got back from our third mobile Bible/Evangelism Training. This time, the location was Bongor; a city that’s kinda the crossroads of central Chad. It’s also just a river crossing away from Cameroon. Anyways, it was another school, just like the others, except it was 2 weeks instead of the prior 1 week then 1 1/2 week of the other trainings. But it went well even so. Jonathan and Melody left on Sunday with the plan to start classes Monday morning. We would have gone with, except Sarah was just getting over a bout of sickness, and I was just starting to get the same thing. A couple days later we were able to join them, and relieve Jonathan who had been teaching about 4-6 hours a day in our absence. A couple days after we arrived, Gideon started feeling bad, along with his parents, so they returned to Béré while we stayed and taught. Finally, Jonathan returned without wife and kid to finish off the training. The people in Bongor were very appreciative for our coming. We were able to visit with some and make friends, and find out a little more about life here. Some of the details are just so sad and so hard to see and hear, broken families, broken hearts. If only we could be a true witness of Christ to them and bring them hope! Without Him, there can be no resolution to the problems that our friends live with here. It’s amazing to hear testimonies, and to realize that different parts of the trainings stood out for different people. Some really like the messages on health, others on how to practically spread the gospel, still others in an understanding of the sanctuary classes. One of our students who came lives in N’Djamena, and was in Bongor to teach classes to the JA (Jeunesse Adventiste, or Adventist Youth/Pathfinders) when he happened to hear that some whites were at the church as well. He arranged the class schedule so he could come to every class we had, then stayed for the second week after his classes were done. He mentioned that he was looking and looking for a class or something that would help him understand the Sanctuary better. I’m glad God arranged it for him to come. Plans are now being made to hold a 2-month, Bible-worker training before the end of year. We are looking forward to that, as it will enable them to spread the gospel in a much more efficient way than we possibly could; with a full understanding of language and culture that we do not have. We’re excited to see the potential of spreading the gospel much quicker, now we are ready to start moving forward and let God take care of the rest. Thank you for your continued prayers and support. We return to the United States in late July for organizational meetings and a quick visit of our home churches before heading back to Chad in early September. We look forward to seeing you all! 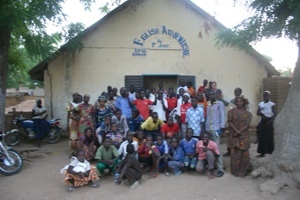 The students and us in front of the church in Bongor.